Following this morning’s news that Apple has acquired Locationary, Bloomberg is reporting that Apple is purchasing the mapping app ‘HopStop’. New mapping software Apple debuted in September with the iPhone 5 has been faulted for getting users lost and for its lack of public transportation directions. 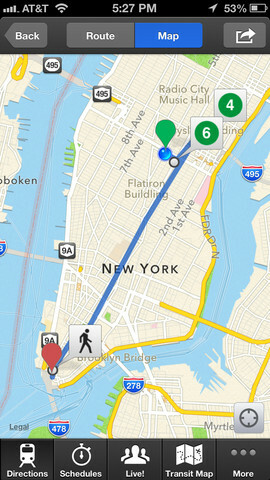 HopStop shows users in more than 500 cities the fastest way to travel by foot, bike, subway and car. Also, the company’s CrunchBase profile claims they have “free door-to-door mass transit, walking, biking, and taxi directions for over 1,000 transit agencies in over 750 cities throughout the U.S., Canada, Europe, Russia, Israel, Australia and New Zealand.” Back in 2011, HopStop’s CEO Joe Meyer claimed in an interview (below) that 70% of users were using the service 25 times or more per month. With that data in mind, it looks like HopStop’s data is extremely valuable for mapping users. OS X Mavericks, which is slated to be released in the near future, will include a new Maps app to accompany the iOS app. HopStop is the only transit app you’ll ever need! Get detailed subway, bus, train, taxi, walking and biking directions, real-time transit information via “HopStop Live!”, as well as official transit maps, nearby station search, and station-to-station schedules in over 600 cities throughout the US, Canada, Europe, Australia and New Zealand. In addition, you’ll benefit from our latest feature, HopStop Live!, which lets you see what other HopStop users are saying, in real-time, about the stations, trains, lines and buses you use most. HopStop Live! empowers our community of millions of transit riders to work together towards a common goal to get everyone to where they need to go, faster. “Apple buys smaller technology companies from time to time, and we generally do not discuss our purpose or plans,” Apple spokeswoman Kristin Huguet said.